TAVR Fight: Smaller Hospitals Want To Do Aortic Valve Replacement By Catheter : Shots - Health News Medicare limits payments for minimally invasive replacement of aortic valves to hospitals with large numbers of heart procedures. But smaller facilities are crying foul. Michael Vigil, an oil contractor from Douglas, Wyo., traveled 250 miles to Denver to have his aortic valve replaced in May. He said he would have preferred his local hospital do the procedure. When Medicare in 2011 agreed to pay for a procedure to replace leaky heart valves by snaking a replacement through blood vessels, the goal was to offer relief to the tens of thousands of patients too frail to endure open-heart surgery, the gold standard. To help ensure good results, federal officials limited Medicare payment only to hospitals that serve large numbers of cardiac patients. The strategy worked. In the past seven years, more than 135,000 mostly elderly patients have undergone transcatheter aortic valve replacement, known as TAVR. 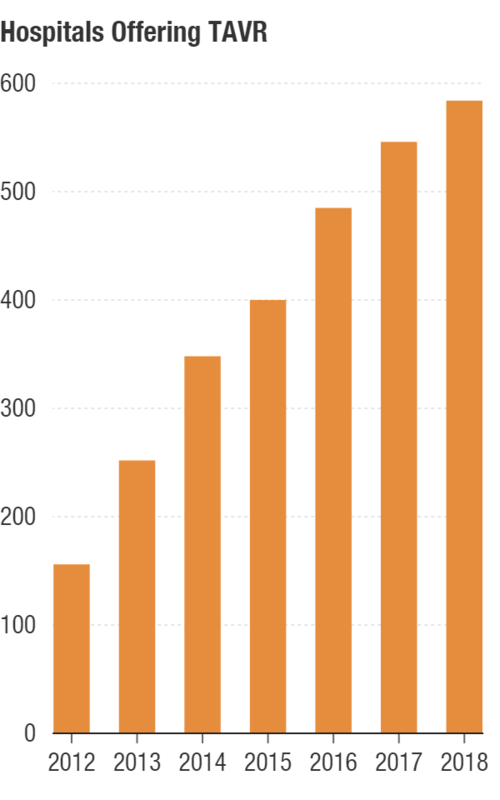 And TAVR's in-hospital mortality rate has dropped by two-thirds, to 1.5 percent. Now, in a campaign motivated by a muddy mix of health care and business, smaller hospitals and the medical device industry are arguing that the technique should be more widely deployed. They note only about half of the nearly 1,100 hospitals offering surgical valve replacement can do TAVR. And they say current limitations discriminate against minorities and people in rural areas, forcing patients to undergo a riskier and significantly more invasive treatment — or miss getting a new valve altogether. Hospitals that already have a TAVR franchise are fighting to stifle new competitors, saying programs that don't do enough procedures would not provide high-quality care. At stake is the care of thousands of patients. Half of the more than 250,000 Americans estimated each year to develop severe aortic valve stenosis — narrowing of the valve that regulates the flow of blood from the heart to the largest artery of the body. Getting an artificial heart valve lowers that death rate to as low as 17 percent over two years, studies show. Also at stake is the $45,000 Medicare pays hospitals for each TAVR case — excluding the doctor's fee. While hospitals typically make only a small profit on the procedure — partly because the device costs more than $30,000 — they benefit because each TAVR patient typically needs other cardiac services and tests that can boost the hospital's bottom line. In addition, offering TAVR carries a cachet that helps recruit and retain top specialists, who bring in more patients. At a Medicare advisory committee hearing in Baltimore on July 25, both sides of the debate emphasized how they were seeking to help patients. But the economics of TAVR was ever-present given the horde of medical device and hospital officials and industry analysts in the audience. The committee split on the issue, although a majority of members backed the continued use of volume requirements. The Centers for Medicare & Medicaid Services is expected to decide later this year whether to change its patient volume minimum for TAVR. Dr. Jason Felger, a heart surgeon who wants his community hospital in San Angelo, Texas, to offer the procedure, said behind the fight over TAVR is protecting profit and revenue. He refers patients to hospitals more than three hours away for the procedure or, if they aren't willing to travel, they risk their lives to undergo the conventional operation. Hospitals that offer TAVR, he said, aren't willing to give up the referrals they now rely on from other hospitals. Unlike open-heart surgery, in which the chest is cracked open to remove the unhealthy valve, TAVR involves threading a catheter tipped with a replacement valve through a blood vessel to the heart. Doctors then implant the new valve. The old valve remains but is pushed aside, and the new one takes over its work. With this less invasive valve procedure, people can get out of the hospital within two or three days and get back to daily activities much sooner than with open-heart surgery, which typically has a six-week recovery time. TAVR has been approved by the Food and Drug Administration for people who cannot have open-heart surgery or for whom it would be risky. These include the elderly and frail and people with complications such as kidney and lung disease. 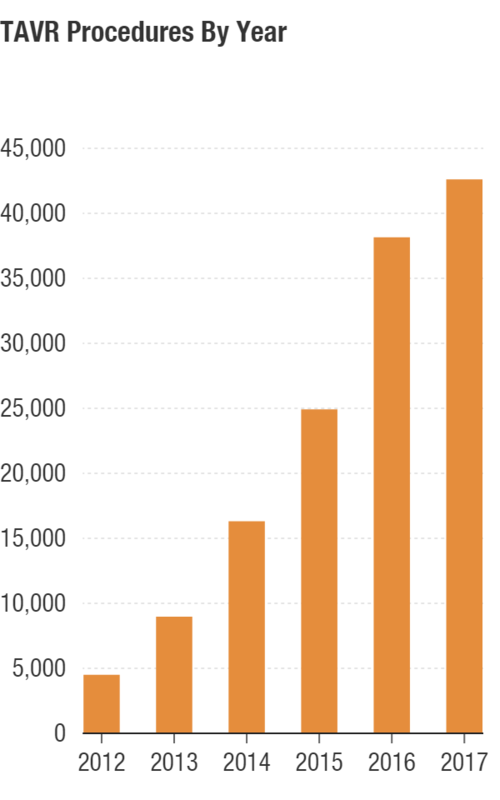 But TAVR use has expanded among younger, and less sick, patients in recent years. Within the next year, the FDA is likely to approve the procedure for all patients needing a new aortic valve, industry analysts say. TAVR does carry risks, including stroke. Patients may also need a pacemaker after the procedure to regulate heart rhythm. The large majority of patients getting TAVR are 65 and over. The importance of Medicare's blessing goes beyond its payments, since private insurers typically follow Medicare standards. Physicians seeking to expand use of TAVR point out that Medicare has no volume requirements for other major cardiac procedures. The two largest TAVR medical device companies are divided on the issue. Edwards Lifesciences Corp. of Irvine, Calif., supports eliminating the minimum-patient requirements, while Minneapolis-based Medtronic favors keeping the status quo. The Advanced Medical Technology Association, or AdvaMed, an industry trade group, also supports the change. About 50,000 patients are expected to have TAVR this year, and those numbers are forecast to double by 2020, according to American College of Cardiology and other major heart groups. 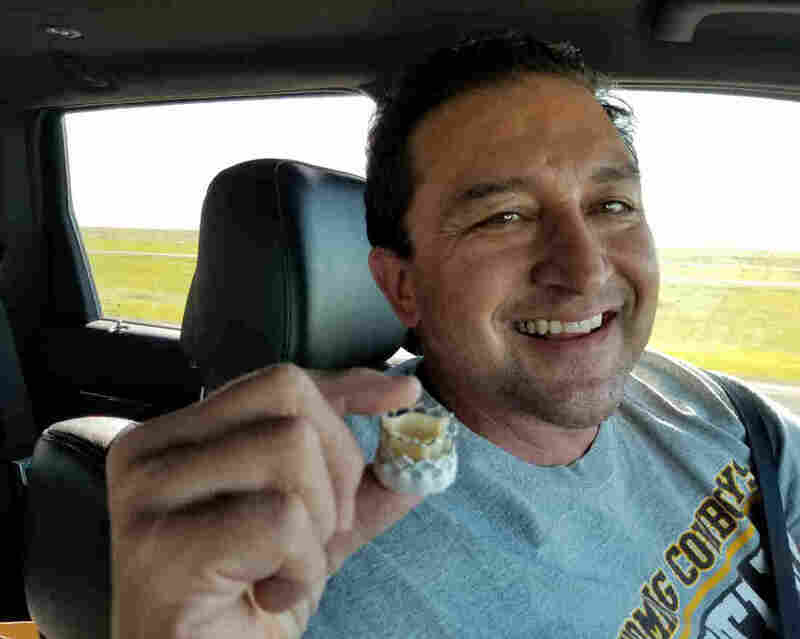 When Michael Vigil, 50, needed TAVR in May, he drove more than three hours from his home in eastern Wyoming to a hospital in Denver. Before the procedure, the oil-drilling contractor was constantly tired and out of breath — even after mundane chores at home. Vigil's aortic valve had been damaged from radiation treatments for non-Hodgkin lymphoma decades before. Vigil was sent home a day after the TAVR procedure. He was back at work the following week. He said he felt more energized almost immediately after having the procedure. "It's worked so well my wife wishes they dialed it back a little," Vigil said. Donnette Smith, president of the patient advocacy group Mended Hearts, said many patients don't have good access to the procedure. "Patients do not know of this option unless they walk through the right door of the right hospital," said Smith of Huntsville, Ala. She had heart valve surgery in 1988. Mended Heart receives funding from device makers. To gain Medicare approval for TAVR programs, hospitals have to perform annually 50 open-heart valve repairs, 400 angioplasties and 1,000 cardiac catheterizations — a procedure in which medical teams use skills similar to those needed for TAVR. Doctors at larger hospitals say procedure volume is a good predictor for success. The American College of Cardiology and the Society of Thoracic Surgeons recommend hospitals be able to do at least 50 TAVRs each year within two years of startup. More than three-quarters of the 582 hospitals authorized by Medicare for TAVR meet that standard. "Whether it's playing the violin or performing heart surgery, experience matters," said Dr. Thoralf Sundt, chief of cardiac surgery at Massachusetts General Hospital. Dr. Ashish Pershad, an interventional cardiologist who performs TAVR at Banner Medical Center in Phoenix, agreed that there are access issues. But he said it's not because of a lack of programs. Rather, he said, surgeons too often don't refer patients for it because they make more money from doing the open-heart surgical valve replacement. "Patients are missing out on this procedure because they are not being referred, and primary care doctors lack knowledge about it," he said. Doctors seeking a Medicare rule to widen access say there is little evidence hospitals that perform more TAVRs have lower mortality rates. As long as they can show low mortality and complications, they believe their hospitals should be able to offer the service. "Our intention is not to lower the quality of outcomes by expanding to 'low volume' centers; but to provide excellent care to a larger population of patients," Felger and his colleagues at Shannon Medical Center in San Angelo, Texas, wrote to the CMS advisory group. Last year, Felger said, he sent a dozen patients to hospitals in Austin or Dallas for TAVR, while eight other patients opted for the open-heart surgery. "I have patients tell me they would rather have the surgical procedure at their local hospital than traveling to another city," he said. "They tell me 'Let's do this; if I die, I die.' "